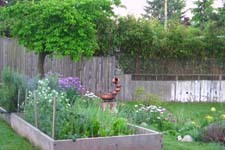 Those who have thriving home vegetable gardens know the satisfaction that comes with eating and sharing fresh produce harvested right from the back yard. Flower gardens bring us the keen joy of watching a plot of tiny seeds blossom into colorful blooms. Between these two, we can reap sustenance, beauty and repose. There remains, then, only one way to coax further bounty from the earth: with the various fragrances and flavors of herbs. If we have limited space, the addition of a few herb bearing plants does not need to be a major production. They can be sown between the rows of a vegetable garden, or occupy some small space in front of a flower bed. We can cultivate tiny herb gardens in window boxes, or even grow them singly in indoor flower pots. In the beginning, in fact, it can be more rewarding to work with no more than five or six plants. That way we can be encouraged by our initial results before we move on to more ambitious gardening projects. Besides, just a handful of varieties can produce a broad range of flavors and scents. Some of the more popular and easily grown species include chives, sweet basil, parsley, catnip, fennel, dill, scented mints, sage, thyme, chamomile and lemon verbena. These herbs, and numerous others, can be grown in the same climatic and soil conditions as other garden plants. 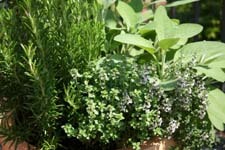 The irony about herbs, however, is that they tend to be more flavorful when sprouted from ground that would be substandard for vegetables or flowers. Poor soil actually promotes the growth of foliage that will be filled with the essential oils responsible for the herbs' distinctive aromas and flavors. We can achieve this effect in our garden rows by churning sand into the dirt. A reliable formula to follow is to mix sand, compost and loam in equal parts. Also we'll want the pH of our soil to lean towards alkalinity, a condition that we can promote by using wood ash or by adding lime a week prior to any other fertilizer. Their tolerance for sandy and even rocky soil makes herbs a natural choice for rock gardens as well. They can fill whatever niche, then, that we can find for them in our yards: on the borders or within the empty spaces of existing gardens, or upon whatever strips of ground are lying fallow and aren't needed for paths or walkways. Whether we begin them indoors or out, care should be taken not to over water our tender seedlings � and to insure that their soil is always well drained. 4-inch pots work best for indoor growing, with a layer of stones laid across the bottom to allow for good drainage. Aside from these considerations, the same basic ingredients are needed for healthy herbs as for other indoor plants: adequate sunlight, moisture, and fresh air of moderate temperature. They should be carried within a cube of earth to the transplanting spot when they're ready for the outdoors. During Colonial times, people tended to grow their herb gardens close to their kitchen doors so they could quickly fetch pinches of chives and oregano to add to stuffing and roasts. The herbs that transform ordinary dishes into gourmet cuisine are fairly simple to cultivate. What's more, they can add new colors and fragrances to our existing gardens and transform the unappealing places in our yards. Beginning by cultivating just a few varieties of herbs, we'll soon bring beauty to our outdoor landscapes and tantalizing flavors to our dinner tables. For more great ideas and free offers on how to beautify your surroundings, please visit our 'Free Home and Garden Samples' categories. There you'll find free sample offers on all things home and garden.